With its exterior styling elements and dedicated interior finishes, textures and colours, Toyota Yaris Trend is aimed at younger customers for who make fashionable design a priority. As well as having distinctive looks, Toyota Yaris Trend retains the fundamental qualities that set it apart from the supermini pack. It may be the most compact car in its class, but clever Toyota packaging means there is class-leading space inside. It also has the tightest turning circle - 4.7 metres - making it a master of manoeuvring in tight city streets and parking spaces. 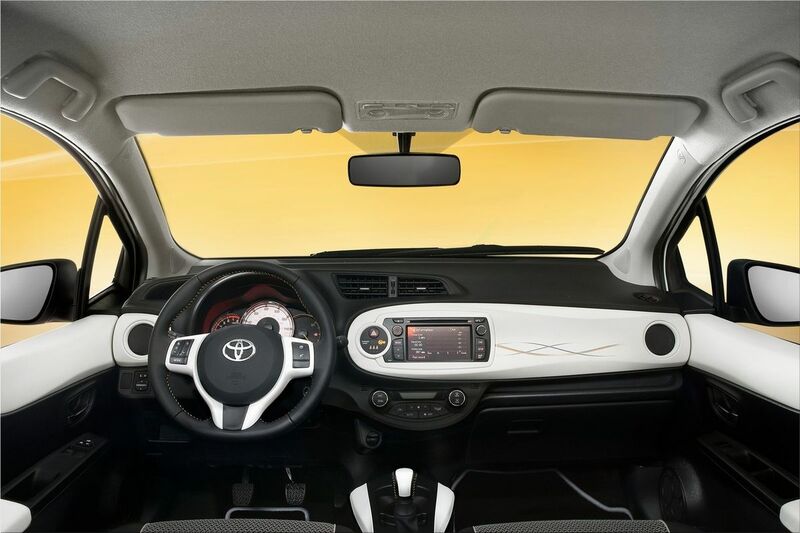 At the time of its launch in 2011, Yaris also had the distinction of being the first car in its segment to offer customers an advanced, but affordable multimedia system - Toyota Touch and, with satellite navigation, Toyota Touch & Go. Toyota Yaris Trend has been styled to amplify the most dynamic elements of the Yaris range, reinforcing the vehicle's distinctive character by emphasising the horizontal lines and strengthening the link between the interior and exterior design. Details around the front end that distinguish the 2013 Yaris Trend include chrome elements in the fog light surrounds and headlamps. Versions with white paint have matching white covers in the headlamp units. The model retains its blacked out B and C-pillars that create a floating roof effect, and there are chrome door sills and door mirror covers. The two-tone 16-inch alloy wheels have machine-finished surfaces and there is a distinctive Deco line surface detail that runs back across the bodywork from the headlights. At the rear there is a roof spoiler and hybrid-style LED lamp clusters. 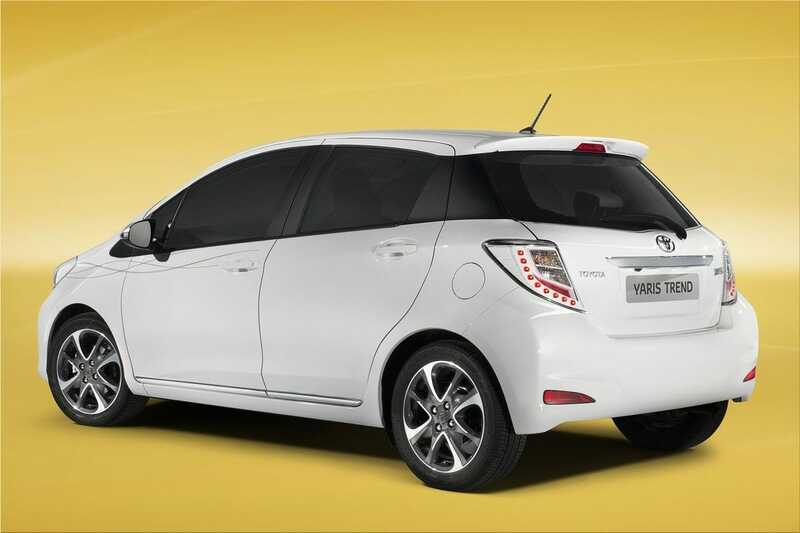 The 2013 Toyota Yaris Trend with Deco line will be available in white or silver, colours chosen to maximise its visual impact; versions without the Deco line will be offered in the full range of Yaris exterior finishes. The interior styling reflects the design theme outside, with a black and white finish - with a contrasting touch of ochre - to create a clean style with plenty of visual impact. The geometry of the centre console has been changed, with the soft-touch dashboard and upper door panels finished in white to emphasise the horizontal lines of the design. The dashboard itself matches the exterior bodywork with Deco line surface detailing. The sensory appeal of the cabin has been raised in details such as the shorter gear shift lever with larger knob, increasing the tactile quality that's also witnessed in the new centre console treatment. Greater visual appeal is achieved in painted trim elements and the use of ochre-coloured stitching. On models with Multidrive S transmission, the shift knob has a white insert and ochre stitching. The black and white design theme is complimented by the seat upholstery. The upper seatback bolsters and headrests are finished in a new, pearl white leather-look material with more ochre stitching and the headrests (front and rear) have the Deco line surface finishing. The seats' central fabric inserts have been made softer and there is new grey piping in line with the change from black to grey seatbelts. The combination meter follows the same colour theme, in black and white with ochre accents.